Anatomy and physiology are the two areas that study the living organisms. Both areas are very important in biology as well as in medicine. 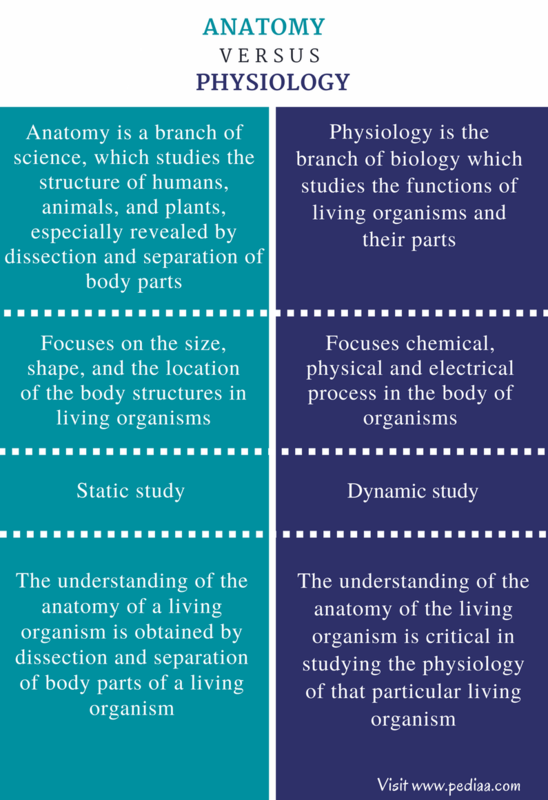 The main difference between anatomy and physiology is that anatomy is the study of the structure of animals and plants whereas physiology is the study of functions and activities of living organisms and their body parts, including the physical and chemical processes in organisms. The anatomy of living organisms is studied by dissection or other noninvasive methods. The understanding the anatomy of living organisms is critical in understanding the physiology of that particular living organism. Anatomy refers to the identification and description of body structures in living organisms. The anatomy can be studied under three broad areas: human anatomy, zootomy or animal anatomy, and phytotomy, which is the anatomy of plants. The two components of the anatomy are gross anatomy and microscopic anatomy. Gross anatomy refers to the study of biological structures, which can be visualized to the naked eye. 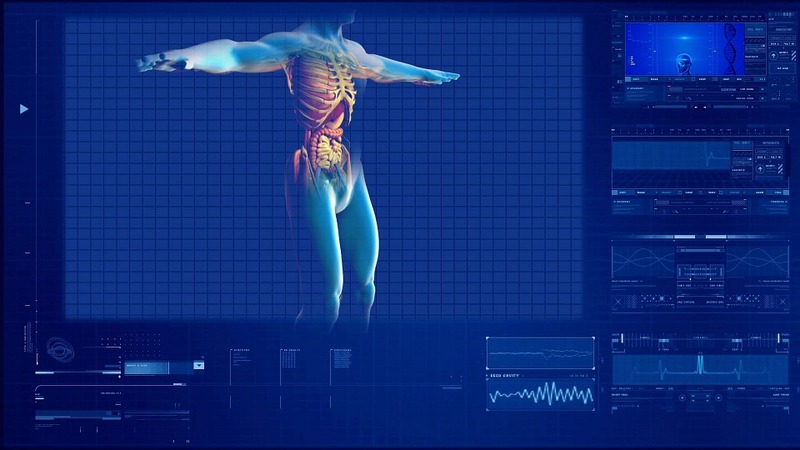 The dissection and noninvasive methods are involved in the collecting data about large structures of the body such as organs and organ systems. The animal is cut open in order to examine the body structures. The anatomy of the gastrointestinal tract can be examined by endoscopy. Angiography is an invasive method used to examine the circulatory system of the animal by inserting an opaque dye to the circulatory system. 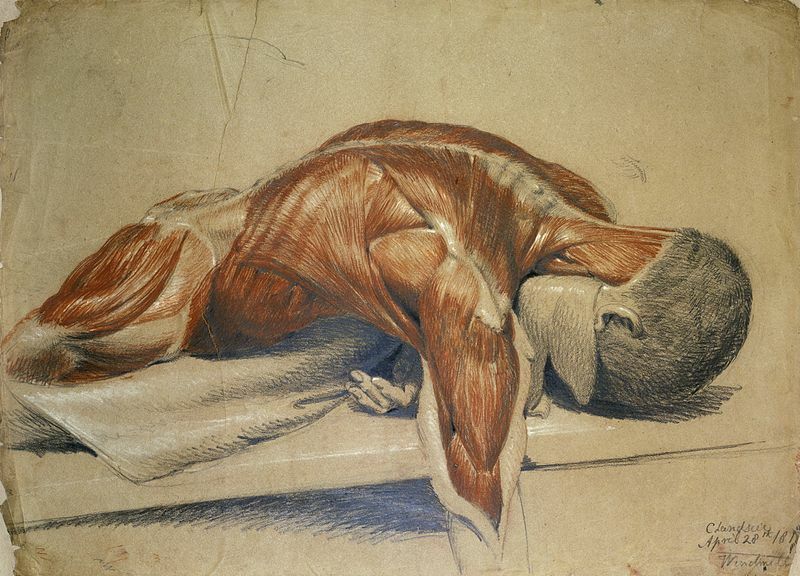 A dissected body, lying flat on a table is shown in figure 1. The microscopic anatomy, which is also known as histology, is the study of cells and tissues of the living organism which are invisible to the naked eye. The cells and tissues can be observed under the microscope. The architecture of cells and tissue, as well as their organization, can be studied by using histological techniques such as staining and observing under the microscope. Only thin slices of tissues can be observed under the microscope. 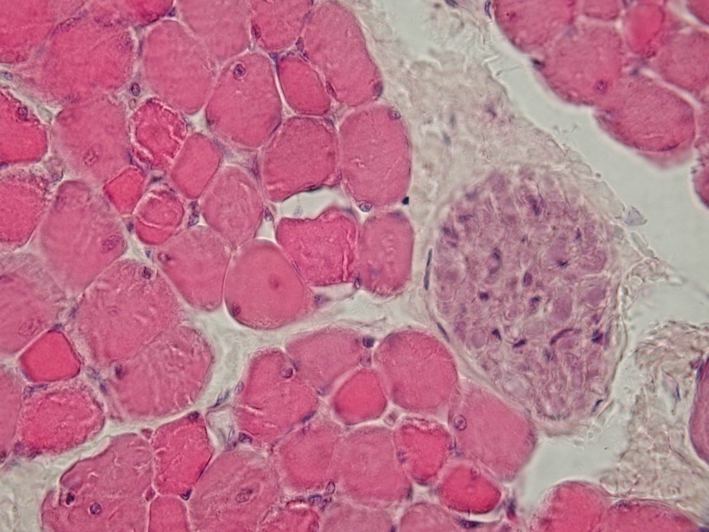 A cross section through a skeletal muscle and a small nerve at high magnification is shown in figure 2. The knowledge of both gross anatomy and histology require for most health-care related studies by medical doctors, paramedics, physical therapists as well as the biological scientists. The study of functions of the living organisms and their body parts is referred to as physiology. Physiology describes both the internal working of organisms as well as their interactions with the external environment around them. It starts from the microscopic level of cell physiology to more complex topics such as ecophysiology, which describes the whole organism and its adaptations to the environment. Physiology is involved in studying how circulatory, digestive, excretory, endocrine, immune and many other systems work in the body of an animal. The physiology of a living organism can be studied under five broad areas: cell physiology, system physiology, evolutionary physiology, defense physiology, and exercise physiology. The study of cell physiology describes the functions and interactions of the cell, transport mechanisms, and signaling pathways of the cell. System physiology mainly focuses on building computational and mathematical models of complex biological systems. Evolutionary physiology describes the adaptions of organs and organ systems over multiple generations. Defense physiology describes how the body reacts to stressful conditions. Exercise physiology is another part of physiology describing the effect of physical exercises towards the normal functions of the body. Both anatomy and physiology are two branches of biology, which studies about the living organisms. Anatomy: Anatomy is a branch of science, which studies the structure of humans, animals, and plants; especially, revealed by dissection and separation of body parts. Physiology: Physiology is the branch of biology which studies the functions of living organisms and their parts. Anatomy: Anatomy focuses on the size, shape, and the location of the body structures in living organisms. Physiology: Physiology focuses chemical, physical and electrical process in the body of organisms. Anatomy: Anatomy is a static study. Physiology: Physiology is a dynamic study. Anatomy: The understanding of the anatomy of a living organism is obtained by dissection and separation of body parts of a living organism. Physiology: The understanding of the anatomy of the living organism is critical in studying the physiology of that particular living organism. Anatomy and physiology are the two branches used to study the living organisms in both biology and medicine. Anatomy describes the structure of body parts in living organisms, either at gross anatomical level or microscopic level. Physiology describes the functioning of the living organism and its body parts. Therefore, the main difference between anatomy and physiology is the areas described by each branch in the living organisms. 1. Nordqvist, Christian. “Anatomy: What is it and why is it important?” Medical News Today. MediLexicon International, n.d. Web. Available here. 03 July 2017. 2. Newman, Tim. “Introduction to Physiology: History And Scope.” Medical News Today. MediLexicon International, n.d. Web. Available here. 03 July 2017.